Progressions students and staff been hard at work these past few months. 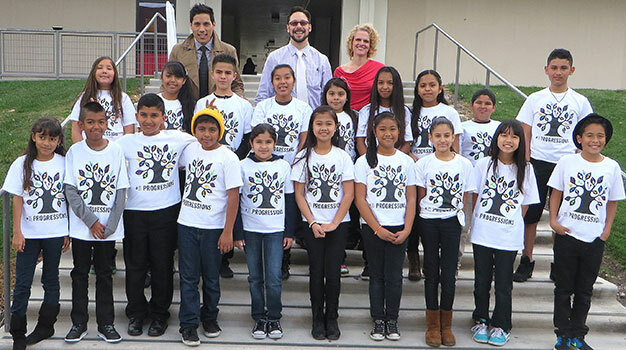 The fall semester culminated with a full house Nucleo performance on Saturday, December 6 at Santee Elementary School featuring 125 proud Progressions students. The intermediate band played the entire version of The Sky and Jingle Bells, our beginning band gave their first ever public performance, our 2nd and 3rd grade singers sang Hip-Hop Reindeer, a cool holiday tune that got the crowd on its feet, our 3rd graders sang about the magic and mystery of the firefly, and more. Afterwards, we shared food and celebrated our accomplishments. Check out more photos of the Nucleo on the San Jose Jazz Facebook page. And now that school is back in session, we are keeping the kids busier than ever. Last weekend we hosted our first Nucleo of 2015, which was attended by 40 of our most eager students. The highlight? The intermediate band’s rendition of Michael Finnegan, which was marked by the beautiful tone of kids who are learning to listen to each other and blend. This week we host a guest performance by New York-based JazzReach. Later this month, our intermediate band will perform at the San Jose Mayor’s Annual Crime Prevention Summit. The Mayor’s Gang Prevention Task Force, a key Progressions funder, is convening the 7th Annual Crime and Gang Prevention Summit, and we are honored to have been invited to participate in the event. Finally—in case you haven’t heard—Progressions was featured on the front page of the local section of the San Jose Mercury News on Sunday, January 18. Thanks to Joe Rodriguez for the amazing coverage! The article was published after he made several site visits and interviewed a number of folks from the Progressions community last fall. Stay tuned in the coming weeks for accounts of how Progressions is transforming the lives of the youth and families we serve!